Need tile repair before your bathroom suffers from massive damage? We’re available to assist you with our Tri-Cities, TN bathroom ceramic tile repair 7 days a week. Contact us at (423) 612-4174 today! Click here to access our online specials page. There are many ceramic tile problems that can occur, but one of the most serious is broken tiles. 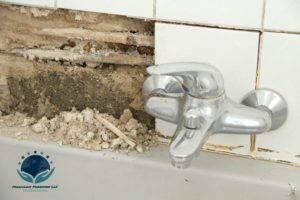 When a tile on your bathroom wall cracks, there is a high chance that your bathroom can become severely damaged by water. Not only that, when you need ceramic tile replacement it can be extremely expensive. At Miraculous Makeovers, our expert tile repair contractors are highly skilled to handle your bathroom ceramic tile repair. However, we also like to keep you informed about these issues so you can recognize what leads to tile issues. Our certified experts can answer all of your tile repair questions and concerns. Call us and let the experts take care of your Tri-Cities, TN bathroom ceramic tile repair services today. How To Prevent Tile Issues? Luckily, damaged tile issues are very easy to prevent, as long as you find a tile contractor thats qualified and you do the appropriate care and maintenance. clean your tile with a damp sponge or soft cloth, using a small amount of non-bleach dishwashing liquid in lukewarm water. If you decide to use a cleaner, make sure it’s neutral non-acidic and non-alkaline. use a cleaner made specifically for ceramic tile. Miraculous Makeovers highly recommends dawn dishwashing liquid. To repair cracked bathroom tile is relatively painless and simple. First, our experts clean the surface with a industrial vigor cleaner to determine the condition of the damaged area. After cleaning the surface, they apply several applications of acrylic filler and sand until smooth. This helps us to rehabilitate the damage to compose a new surface. We will perpetuate with a bonding agent and an acrylic urethane coating, chemically bonding an incipient finsh over the rehabilitated area. Do you know how to replace bathroom tiles that have fallen off? Our bathroom repair contractors have more than 10 years of involvement in bathroom ceramic tile repair, we will bond free or missing tiles back in place, regrout your whole bathroom and refinish the surface to give you a shiny new look. Whatever your needs are, we are prepared to help with our expert bathroom repair contractors. We utilize the latest techniques and the best products available to perform bathroom shower tile repair. Our bathroom repair cost will always be dependable and affordable for your budget over bathroom tile replacement cost. We generally give great bathroom ceramic tile repair benefits with upfront pricing and handle each tile repair project professionally . We provide customized services: Ask your bathroom ceramic tile repair experts at Miraculous Makeovers about your options, and we will help you come up with a plan of action to meet your bathroom ceramic tile repair budget. We’re a locally owned company: Because we’re a locally owned business, we can save you even more money because we are not paying franchise fees. You can expect to receive friendly service and the personal attention you deserve. upfront pricing: Our bathroom ceramic tile repair experts will provide you with an upfront estimate before we begin any work, so you can make an informed decision and feel confident in our work. Don’t let damaged tile ruin your home! Call Miraculous Makeovers at (423) 612-4174 at the first sight of trouble! We will come to you immediately.